Hear from HP Retail Solutions VP and General Manager, Aaron Weiss on how innovative design and performance point-of-sale are merging to elevate the customer experience. A friendly, easy-to-use technology design is vital to the customer experience. Hardware that blends into its environment and is designed for customers to interact with, helps drive action and engagement. 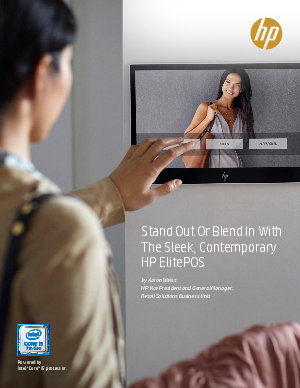 A slim, accessible device like the HP ElitePOS – powered by Intel® Core™ i5 processors – caters to the variety of needs that customers encounter throughout any retail experience.